During the housing bubble, just about anyone who could apply for a mortgage was able to get one. A decade after the crash, the largest lenders are loosening their standards again to make housing more accessible to first-time buyers. Fannie Mae, the largest source of US mortgages, is making it a little easier for people with all kinds of existing debt — including student loans — to qualify for mortgages. The change will kick in on July 29 when the debt-to-income ratio (DTI), a measure of a borrower’s capacity to make payments, rises to 50% from the current 45%. To understand what that looks like, let’s say a household earns $5,000 a month and makes monthly debt payments totaling $2,250. Its DTI, debt payments divided by income and expressed as a percentage, is 45%. That’s right at the current ceiling, and a lower DTI would be better. But when the ceiling is raised, a second household with the same income that spends $2,500 on debt payments would have a DTI of 50% and be just as qualified. The $250 extra spent monthly on paying down debt would be less of a drag on their application. Student loans are the largest source of debt in the US apart from mortgages. And so, this eased requirement could benefit millennials who are looking to buy their first homes. Amid accusations of overspending on avocado toast and, more plausibly, escalating home prices, the homeownership rate for Americans under 35 — and the rest of the population, in fact — is at the lowest level in several decades. Whether this change actually makes a dent on the homeownership rate is still unknown. “There is data to support the fact that many people are already getting loans at the highest threshold,” said Mark Fleming, the chief economist at the title-insurer First American. The American Enterprise Institute has noted that several lenders are already raising the share of borrowers they approve with DTIs above 43%. That’s the threshold recommended by the Consumer Financial Protection Bureau, though lenders can breach it if they can reasonably show that the borrower won’t default. Furthermore, the bigger issue with millennials’ ability to purchase their first home is not access to credit, but making the down-payment, Fleming said. For existing homeowners who are likely older and further into their careers, the higher DTI ratio is “a moot point,” according to Fleming. Most housing transactions in the US are made on homes that already exist. Additionally, lenders examine more than just the DTI ratio to make decisions on who to approve. A prospective homeowner would still need good credit and a steady income, among other considerations. And while these looser standards may bring flashbacks of the housing bubble, Fleming says the current market environment is not quite the same. 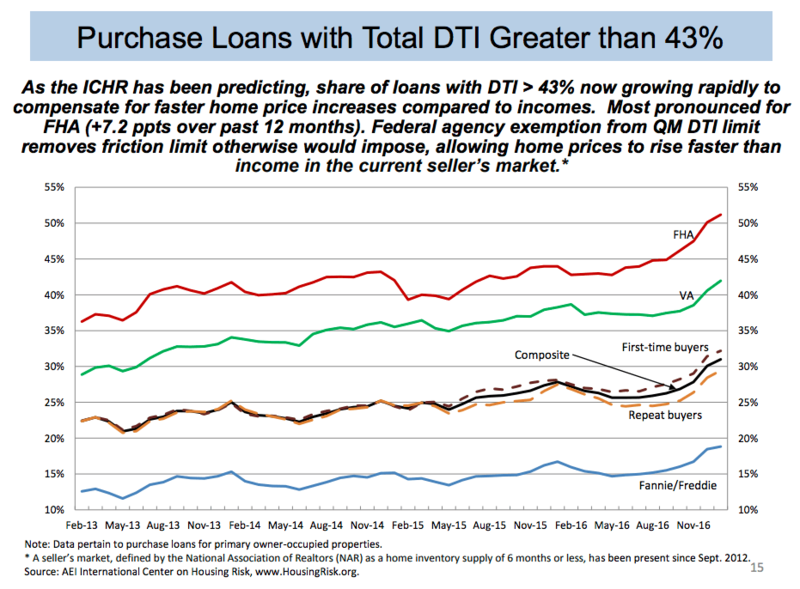 At least lenders bother to verify income, demand a downpayment, and check the DTI ratio. “There’s a big difference between asking the maximum standard for ability to pay and basically not measuring one’s ability to pay at all,” Fleming said.